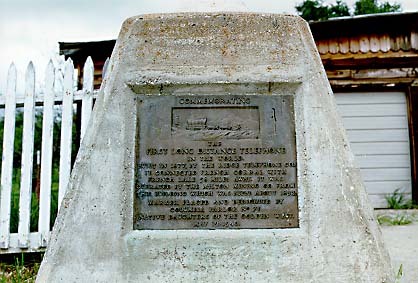 Commemorating the first long distance telephone in the world. Built in 1877, by the Ridge Telephone Co., it connected French Corral with French Lake 58 miles away. It was operated by the Milton Mining Co. from this building which was built about 1853. On Pleasant Valley Rd, in center of community of French Corral.